Developing your greatest talent - You! The International Academy and Boarding School of Denmark is not just about academic development; it is about social and personal development, too. Through dialogue, debate and social interaction you will work on defining your individual needs, values and identity, to develop yourself personally. 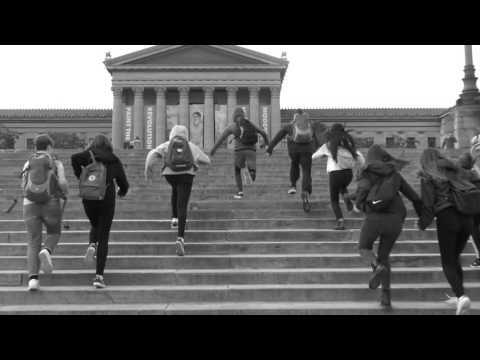 Just like in our 'Rocky' parody video that our students filmed in the US, you will be stronger both mentally and physically after a year at The International. At The International, we encourage participation in all elements of efterskole life and provide you with a number of different responsibilities and activities to ensure that you will be challenged on a daily basis, both individually and in the context of a group. A year at efterskole encourages personal growth and self-discovery. You will gain social maturity, a better understanding of the need for interdependence and cooperation in society, as well as enhance your sense of empathy and improve your interpersonal skills. There will also be numerous activities that will require leadership skills and the ability to problem-solve, as well as those that require compromise and team-work. You will often be forced out of your comfort zone in order to improve your ability to react in challenging and difficult situations in the future. Lessons will contain a variety of individual and group work, often using cooperative learning to encourage participation in debates and discussions. Project and group work, as well as numerous presentations, will help improve your communication skills and give you the confidence to interact with others. Subjects such as Global perspectives and International relations, in particular, will help you to gain perspective on life, think critically and challenge your assumptions, so that you can benefit from better understanding of yourself and the world in which you live. Our professional staff and your tutor group, along with the community of the efterskole as a whole, will support you throughout to ensure that you have the necessary support and encouragement to achieve both your personal and academic goals.